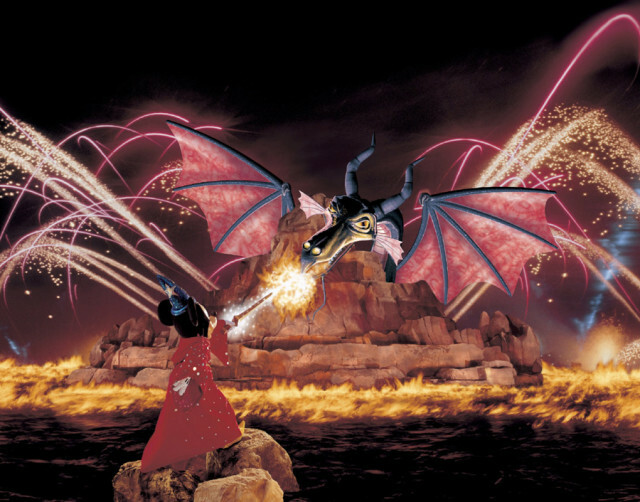 Today is #Day7, and we are looking at Fantasmic in our #DisneyWorldCountdown! Image ©Disney Parks. Fantasmic has been a fixture at Disney parks for over 22 years, and yet, it is a show that my family has never seen. That will be corrected this year because we have a FastPass time for it, and I am excited to see if it is worth the hype or if it’s something that we’ve seen once and never need to see again. Fantasmic tells the story of Mickey Mouse and his incredible imagination, and how it can cause wonderful imagery to be shown to us, but can also lead us to to adventures of a serious nature. The show features fireworks, live actors, music, water effects, and more! Having not seen the show before — not even on YouTube — I don’t have much information to impart to you about this. I think, though, that it will fall somewhere between a “see it once and not again” to “must see each and every time” show. What do you think, though? Do you love it, or not love it? I’m really interested in what you have to say, so please leave me a comment and let me know! Thanks, and remember to go out and make today and every day a great Disney Day! Tanya’s Review of Fantasmic! at Walt Disney World! 2 Days til Disneyland – Fantasmic! 94 Days til Disneyland – Mr. Toad’s Wild Ride!